The Gama Sonic GS-6 solar-charged LED light plus hanging planter helps enhance a home’s curb appeal. The unit has an attractive black finish and installs with no wiring. Its super-bright white LED light–powered by an included solar-charged Lithium Ion battery –turns on automatically at night. The solar charging panel can be positioned up to eight feet from the light. 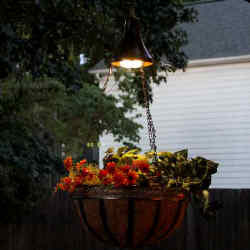 Attach the hanging basket to the light fixture for the added the beauty of illuminated foliage. The Gama Sonic GS-6 hanging solar planter provides warm light for your porch and deck. It also includes 22-inch chains and a metal hanging basket you can use to attach, display, and illuminate flowers or plants. The light fixture is made from durable, rust-resistant poly-resin and sports an attractive black finish. It installs with no wiring–just hang it on a hook and place the solar panel up to eight feet from the light for optimal sun exposure. The fixture measures 7 inches high and 5.5 inches in diameter. The solar panel is 8 inches wide, 4 inches tall, 2 inches thick with a 4-inch mounting plate. At dusk, the light’s six warm-white LEDs turn on automatically and shine at a brightness of 40 lumens for eight hours after a full solar charge of the included 1,300 mAh Lithium Ion battery pack. Recharging speed varies based on weather conditions, but generally it takes about six hours of sunlight on the solar panel to achieve a full solar charge of the battery pack after it’s been completely run down. Recharging speed varies based on weather conditions, but generally it takes about six hours of sunlight on the solar panel to achieve a full solar charge of the battery pack after it’s been completely run down. For any unexpected issues, Gama Sonic support at our Atlanta headquarters is here to help.